Congratulations! If you’ve made it this far you’ve successfully set up your Google Webmaster Tools account and have verified your account as well! In part 2 of this 3 part tutorial we’re going to dive a little bit deeper down the rabbit whole and work on learning the ins and outs of what Webmaster Tools has to offer. Now that your site is linked with Webmaster Tools, go ahead and login to view your updated dashboard. It will take a few days for the analytics to begin popping up, such as the search queries and craw errors, so if you’ve moved on from part 1 immediately it may be best to wait until these areas have been populated and Google has had time to crawl your website. If Google has enough data to present to you, your dashboard should look something similar to the dashboard I have setup below for an example website. It briefly covers your site’s traffic as well as displaying any errors the Google bot may have encountered while crawling your website. All of these options may seem a little overwhelming at first, but don’t worry. We’ll break them into chunks and dissect them piece by piece so that you can get the most out of these features and understand what’s going on in each and every one of them. Under the site messages tab Google will let you know if the bot has had any problems crawling your website or if there have been any manual penalties applied to your website. 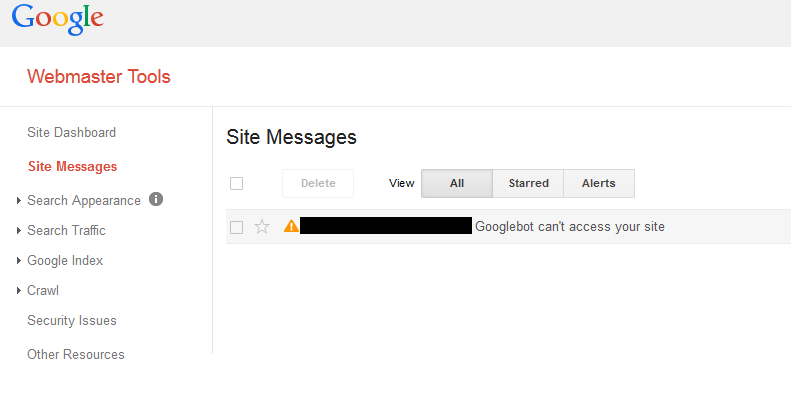 Most commonly these messages will be regarding crawling issues and should be taken into consideration because if the bot can’t crawl your site it won’t be indexed on Google, and as a result will not show up in search results. As seen above for this test website, we experienced a problem when Google wasn’t able to crawl our website. After opening the message, we found that on this example website the bot had trouble with a vast majority of our pages. Because Google was kind enough to send us a message we were able to determine that it was still trying to crawl a large part of this website that was now non-existent; an old forum. 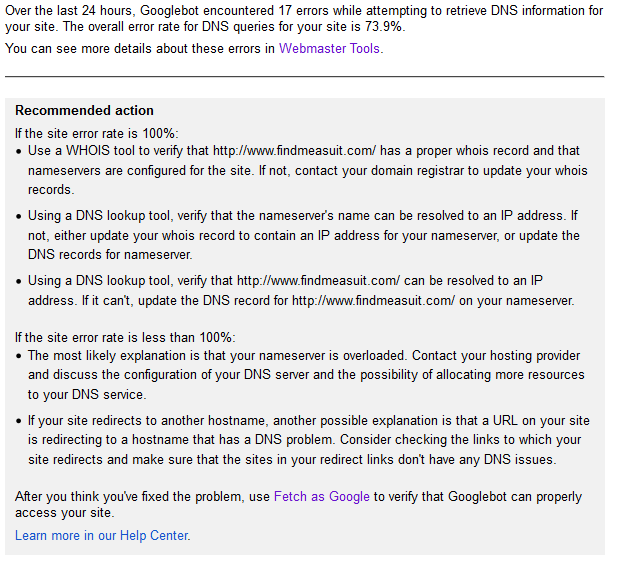 Because the forum wasn’t there anymore Google thought it was running into an error and let us know. Be mindful that while this was not a big deal for this specific instance it may be very serious and must be researched fully to make sure the problem is corrected, if it is still outstanding. To check if your pages are still not being crawled, just click the “Webmasters Tools” link at the top of the email and you will be brought to the Crawl Errors page. As shown above, the problem had corrected itself as the pages were no longer existent on our end over the past 90 days. Again, the type of error you receive from Google must be treated on an individual basis, and will require research on your part to determine if action is needed or not. Under the search appearance tab you will find options for structured data, data highlighter, HTML improvements and Sitelinks. We’ll break these categories into 4 parts and cover them individually so that we can keep a good handle on them. To figure out what these errors are, simply click the red exclamation point and you will be redirected to a new page highlighting what Google believes the problem to be. In our case, we were missing some tags for the author, entry-title and last updated information on 3 of the articles for the test website. The new Data Highlighter feature in Webmaster Tools is a cool new way that allows you to markup the information on your website in way that makes it easier for Google to digest and figure out what your website is all about. This great new tool is much easier to use than the traditional markup that was code based. Take a minute to watch the below video, and then give it a shot yourself! 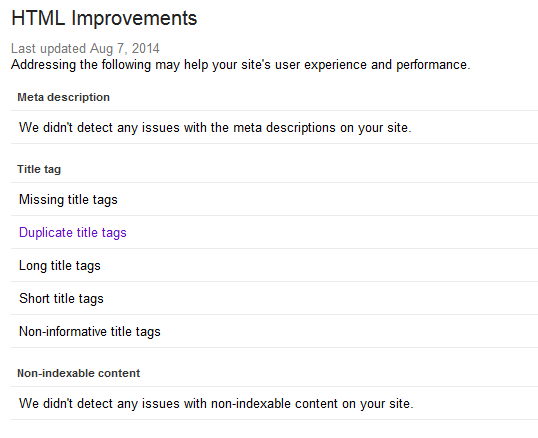 Underneath the HTML Improvements section Google will let you know if it has seen any irregularities within the HTML coding of your website. Generally, they will be reporting to you on broken, empty or all-together missing tags that could put a hamper on your users’ experience while on your website. If you have any of these errors you can simply click on the error type and Google will happily show you all of the specific instances of that error. Pretty cool, right? The search queries page shows you which search terms people are using to find your website. 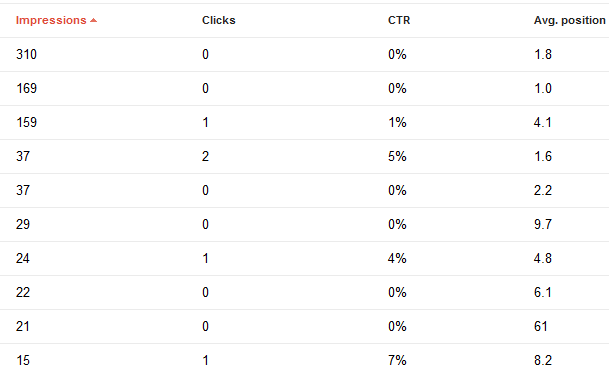 You can order your query terms by impressions, clicks, CTR (click-through ratio) and Average position. With this tool you can easily tell which keywords are most popular and also how well they are doing at driving traffic to your website. If you have experience with SEO you can download the table of results and analyze it, mapping out your own keyword strategy. The links to your site page gives you a quick rundown of who is linking to you, your most linked to pages and how your data is being linked. In our test website’s example we can see that there are 24 total links coming to our site, as well as who has given us the most links. Additionally, we can see which pages are linked to the most, giving us the notion that we should be focusing time on these pages to make them the best we can as they are popular for viewers to look at. The internal links tool is used to see how many times a certain page on your website has been linked to from within your own website. While this guide is covering how to use Webmaster Tools and not informative regarding Best SEO practices, we recommend checking out Moz’s Internal Link Guide to learn how to effectively and safely use internal links on your website. If you’ve done anything that Google may regard as a spam tactic or anything related to spam, you’re going to find out about it here. It is important to periodically check this folder as a manual action means that an actual human being has reviewed your website and found that you have violated the Webmaster Guidelines. If you do have a manual action against you, take the time to analyze the action and research what you can do to have it removed. The penalty could be a result of a bad link profile or content that is written in a spammy form, it is up to you to interpret Google’s findings and choosing the appropriate course of action. We’re Halfway There, Stick With Me! Go ahead, take a little break and allow yourself to digest all the information we just covered. It’s a lot to absorb all in one shot, so don’t be afraid to re read any sections or view a few more videos if you still have some questions. Remember, you can always send us a tweet to @techfunction and we’ll be glad to help you out the best we can! When you’re ready to finish up, head on over to the Second Installment of Chapter 2 and get cracking!